When I have trouble coming up with ideas, I find that the best thing to do is to stop trying to come up with ideas. I take a break and do something that occupies my brain with some other task. TV and video game breaks don’t seem to help me. It works better if I go for a walk or do a sudoku/crossword puzzle. Something that isn’t creative but keeps my mind going. Quite often, I’ll get an idea after just a few minutes of not trying to get an idea! 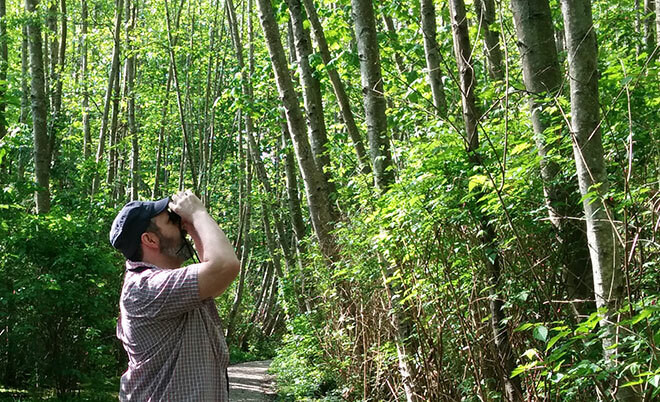 Out for a walk, looking for cyborg porcupines in the trees. Another thing that I use to get out of writer’s block: random word exercises. I’ll use one of those online random word generators, or maybe even just click the Random button on my own website, and then brainstorm about a word for five minutes to see if anything funny shows up. Sometimes I scribble drawings and ideas associated with the word. Sometimes I’ll draw a mindmap around the word. If nothing happens after five minutes, I’ll generate another word and try again. Sometimes two random words is better, because a lot of funny ideas come from bringing two random things together. 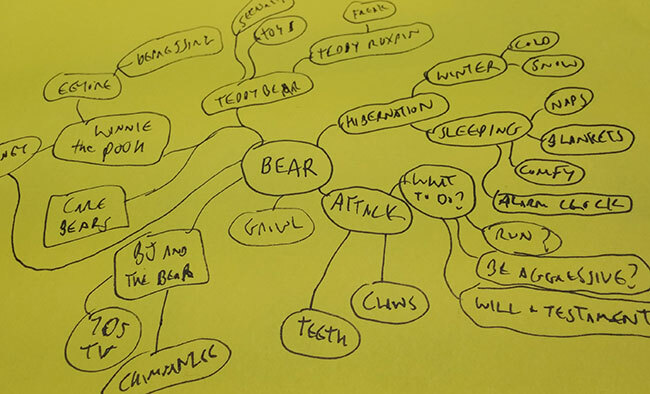 Here’s a mindmap I drew, riffing on the topic of bears. Just start drawing. Don’t let your pen stop moving for five minutes. Fill a sketchbook page. See what happens! 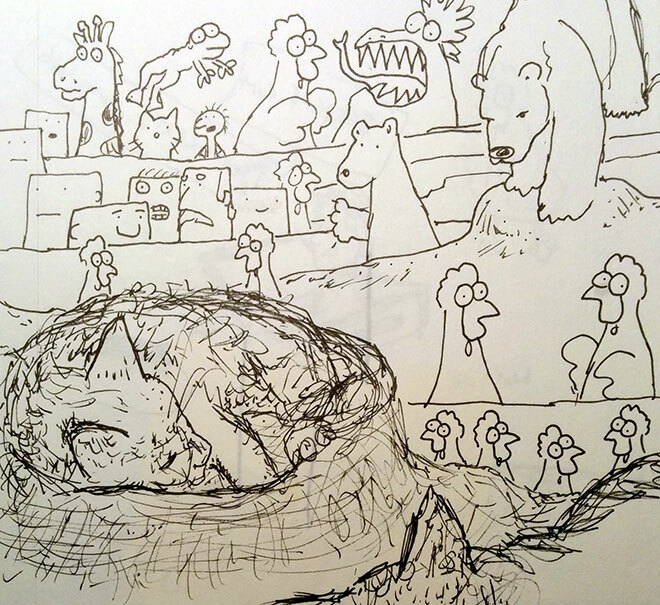 Long ago, before Savage Chickens, I would deal with writer’s block by drawing a page full of chickens. Chicken after chicken after chicken, and you start to zone out and that’s when the ideas crop up. A random doodle page from my sketchbook. These are great ideas! I’m always impressed by how you keep coming up with funny comics day after day. Love the doodling idea, in particular. I write fiction, so my best way to get the muse moving is to come up with a question (about the character, or situation, or whatever) and go for a walk and either zone or muse one the question. Just the movement seems to get things going again. I think questions are particularly helpful because my brain seems to want to find an answer. If my mind is entirely blank at the start, my brain seems to have a harder time. Maybe I should try the random words as well. Might be interesting to see what pops up. Ooh I like that question idea, Kieran – I’ll have to give that a try – thanks! Cool. So what kind of comic came out of the bear mindmap?